On several parts of the nature reserve sheep or cattle or goats are used to manage the grassland. We are using local Romney sheep to maintain the grassland suitable for birds that feed, roost and nest on the ground. If you walk the footpaths with livestock in please keep all dogs on a lead. Thank-you. In the SOUTH part of the nature reserve the sheep are all within fenced areas with no public access. In the NORTH part of the nature reserve there may be sheep and/or cattle along the footpaths at all times of year. Click here to go to our map page. With no sheep most of our grassland would quickly become scrub and then woodland, but with too many sheep there is very short grass and very few flowers. Now some of our wildlife does like very short grassland eg Lapwing, but many more species like longer grass. So we are developing a mosaic of grazing regimes. One example that benefits flowers and bumblebees is to have sheep grazing September-March and then no sheep April-August and this encourages the red clover, bird's-foot trefoil and meadow vetchling that are so important to the longer tongued bumblebees. A few areas have no grazing at all, developing tussocky grass and scrub with trees and in some of these areas we cut the vegetation to maintain greater structural diversity. 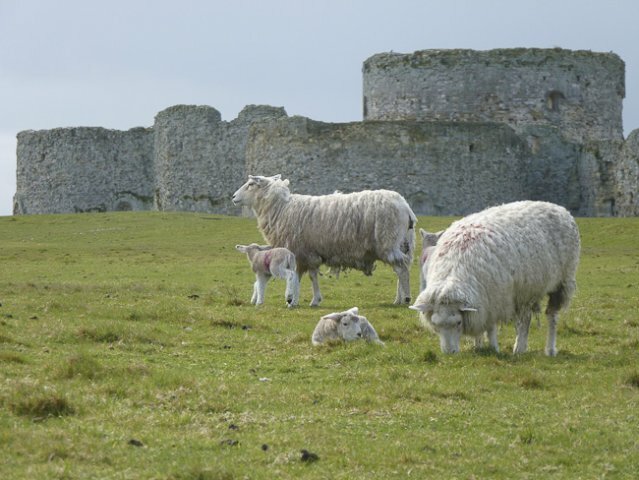 The sheep are Romney, also known locally as Kents, the traditional breed of the Romney Marsh that were probably brought here by the Romans!